Streetcars nearby Manseibashi Station in Tokyo as seen from Sudacho. 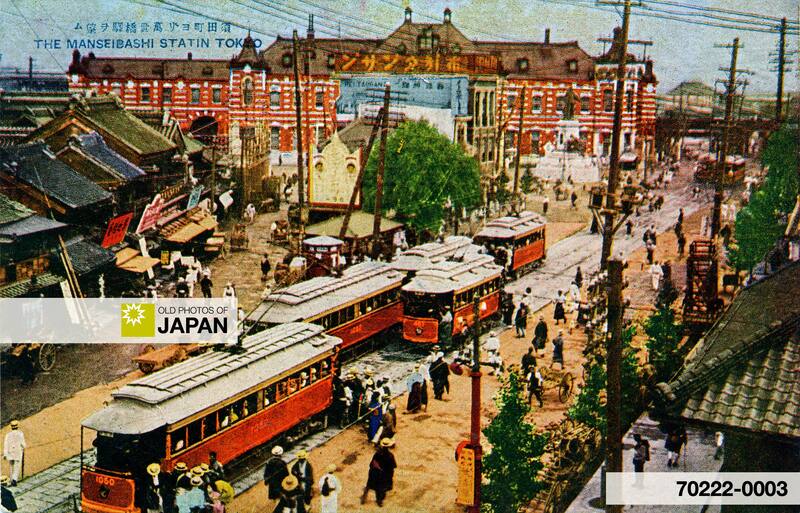 The station, opened on April 1, 1912 (Meiji 45), was designed by architect Kingo Tatsuno (1854-1919). The building was destroyed by the Great Kanto Earthquake of 1923, but a new building was built after the quake. Over the years, passenger numbers declined as other stations took over Manseibashi’s functions. In 1936 (Showa 11), it was given a new lease on life when the Railway Museum was installed here. Manseibashi Station was officially closed in 1943 (Showa 18) and the station building was torn down. The Railway Museum, now named Transportation Museum, remained until 2006 (Heisei 18), when it was moved to a new Railway Museum in Saitama. Sudacho managed to survive the airraids of WWII fairly well and still offers a few remnants of prewar Tokyo today. You can also licence this image online: 70222-0003 @ MeijiShowa.com.